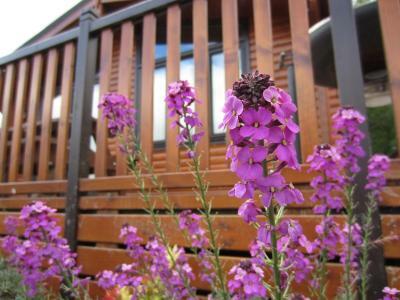 Lock in a great price for Inverbeg Holiday Park – rated 8.8 by recent guests! We arrived close to 9pm, and were received by the night security. We stayed in the S-Pod, a lovely little self-contained unit with everything you need within 5 to 10 steps. The stove and sink were exceptionally functional, as was the toilet and shower, and the heated towel rack. The bed was a fold-down, similar to a campervan. There was a handy convertible table stowed under the sofa. Modern convenience in an idyllic setting. I couldn't recommend this more. The pod is amazing! It has every creature comfort, even cruets and toast holders! The bed is comfortable and bathroom wonderful. It we had stayed longer we definitely would have cooked in the awesome kitchenette. Amazing location! 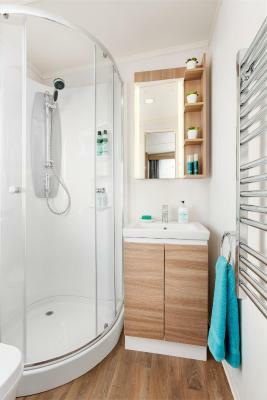 The s pod was genius, compact and cosy with a great comfy bed, everything you need contained within. Lovely surroundings a couple of minutes stroll to the lochside and stunning scenery. The site shop was well stocked too with friendly service. 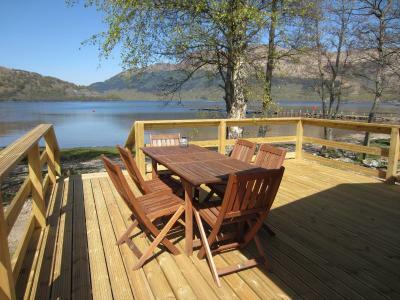 Great value for money and amazing location right on the shore of the Loch. We didn't want to leave! Caravan squeaky clean and looks brand new. Great playground, also brand new for kids to play. Children enjoyed walking to the small shop by themselves. Great stay. Very cosy in a stunning location. 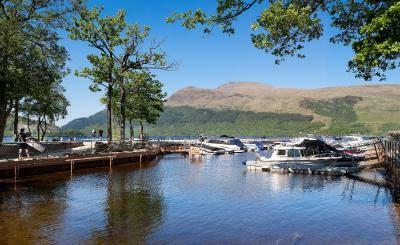 Balloch is only a 20 minute drive away and is packed with restaurants and shopping. Would definitely come back again. Staff were great and the park is in a perfect location. Staff were great and did everything to welcome us to the park. Everything was great, no issues. Only thing I expected that wasn’t there was free WiFi but phone signal was good so didn’t cause any issues. Staff provided me with a charger for my phones as I had forgotten mine which was very much appreciated. S Pod that we were staying in had everything we needed, much better than a hotel room. Inverbeg Holiday Park This rating is a reflection of how the property compares to the industry standard when it comes to price, facilities and services available. It's based on a self-evaluation by the property. Use this rating to help choose your stay! 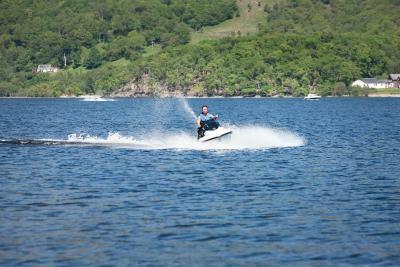 Inverbeg Holiday Park offers lodges and static caravans in Inverbeg, on the banks of the beautiful Loch Lomond. The park features its own jetty with a private boat and beach area. Free WiFi is available in some areas. 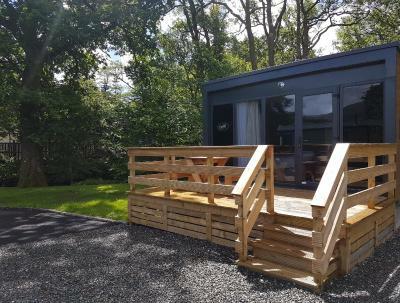 All accommodations at Inverbeg Holiday Park opens onto a veranda. Interiors offer attractive, modern décor and fittings. All the lodges and caravans offer a living area with a flat-screen TV, and kitchenette facilities including a fridge-freezer, kettle, toaster and a hob. A small selection of shops can be found in the lochside village of Luss, a 5-minute drive South of the park. The surrounding Trossachs hills are ideal for hiking and you can go cycling by the loch. You can visit charming villages along the lochside and the small town of Balloch is just 15 minutes’ drive away. Glasgow and its airport can be reached in 40 minutes by car. When would you like to stay at Inverbeg Holiday Park? 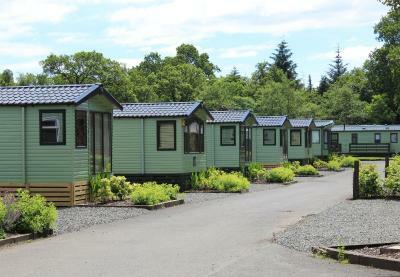 Opening onto a veranda, these luxury static caravans offer a good-sized lounge with free standing dining room furniture. The kitchen offers ample storage space and a built-in fridge freezer. The caravan consists of of 2 good-sized bedrooms, one double with adjoining toilet, and one twin. 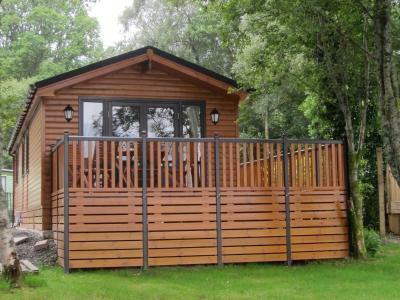 Opening onto a veranda, these luxury static caravans offer a good-sized lounge with free standing dining room furniture. The kitchen offers ample storage space and facilities including a built-in fridge freezer, kettle, oven, toaster, microwave and hob. The caravan consists of of 3 good-sized bedrooms, one double with adjoining toilet and two twin rooms. 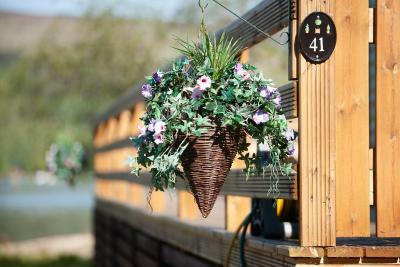 Opening onto a veranda, these wooden-framed chalets have attractive, modern décor and wooden fittings. There is a living area with a flat-screen TV and kitchenette facilities including a fridge, kettle, oven, toaster and a hob. House Rules Inverbeg Holiday Park takes special requests – add in the next step! Inverbeg Holiday Park accepts these cards and reserves the right to temporarily hold an amount prior to arrival. Please inform Inverbeg Holiday Park of your expected arrival time in advance. You can use the Special Requests box when booking, or contact the property directly using the contact details in your confirmation. Nothing that was within the parks control. Lovely accommodation, s pods are ideal for 2 people! Magnificent views. Staff very attentive. Nothing, everything was perfect, thank you. Cleverly designed pod, clean environment, very friendly and helpful staff. Thoroughly enjoyed our stay. Perfect end to our travelling holiday, great location 5 minutes away from Balloch with an array of different activities nearby for all. Location on Loch Lomond is amazing. We thought we were getting a cabin but it was a pod. The sofa was actually a pull down bed which was very hard. To be honest I wouldn't have booked it had I known, the pictures and description were a bit misleading and no info about it being a pull down bed. A little overpriced for what it was at that time of year. The staff were excellent, went out of theur way to help. The pod was very nice and the park overall, although small, is nice and surrounded by lovely scenery. Would like to return for the summer but to a bigger cabin. Pod was very nice and well equiped though, although no table indoors for eating breakfast/dinner.